Today is the first day that Mississippi Senate Bill No. 2681, a law allowing businesses to refuse anyone who they think might be LGBT people of service. As repugnant as this law is don;t be fopled. This is a very dangerous state-level RFRA, which gives “Christians” a blanket exemption from any law they find objectionable. It’s a nearly identical law at the federal level that allowed Hobby Lobby to get an exemption from Obamacare. 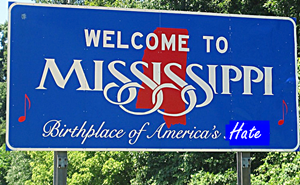 In related news, Missisippi was just named the most corrupt state in America. gleaned by an extensive study by Fortune Magazine.